Are you in need of a December boost? 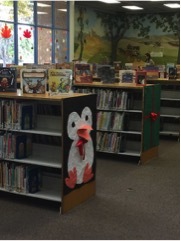 Here are a few ideas from the Simi Valley Public Library in California. Mix up your December routine, reinvigorate your library team, and use your fun efforts as an opportunity for advocacy of all library services. How are your Circulation numbers doing? Are your books leaving your library? Simi Valley Pubic Library set up a circulation goal of 21,500 item checkouts for December 2017, just slightly higher than our numbers for December 2016. Interestingly, our December checkouts tend to be less than November, even when important Holidays fall in December. Thus, when it comes to “Operation: Gets the Books Out” we must be intentional, we want to be motivated, and we want to go the extra mile. It will be easier for library users to grab books that are readily available. Caregivers with small children will appreciate your shelf displays, since there is not much time to make a book search. 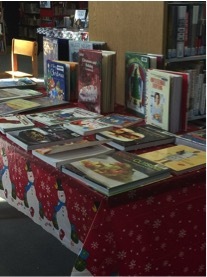 Book displays can have a variety of related subjects. For example, you can display Holiday picture books together with Holiday cooking books, and Holiday-themed novels for readers of all ages. Do not underestimate the power of the Circulation Desk. This is the area where all your patrons ready to go home will be looking at before checking out. Our Library Director suggests we think of the supermarket that has all that delicious candy right on the cashier line. Your items want to be the suggestive candy when patrons are about to leave the library. Remember to have your staff on board. There will be a larger impact on your check out items if your staff is involved. Include Circulation Desk, Reference Desks, and your roaming staff. 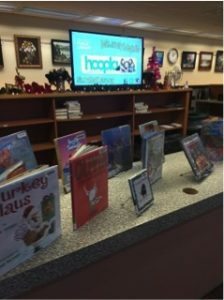 Moreover, have the staff performing programs bring carts with theme related books to programs. Working as a group not only reinforces your team’s strengths, but also increases the end result of your goal, in this case, getting the books out. How much of your space and staff do you use to improve circulation?